Trend hair color, what trends are there in 2016 ? About ombre and sombre much said, despite the fact that is actual in 2015, 2016 trend will be saved in any differences. So the new season begins and of course, we begin 2016 with new ideas. For double colored hair painting, good and interesting ideas offered by well known stars,whose new stylish hairstyles and types of painting hair well investigate together. Double process hair color is marked out for brunnets in hair color trend, even with three and for colored hair. Of course, this not means that hair is dyied in various colors, this mainly threated toned color of different shades. This tecnique (Technique Ombre, Sombre, Balayage), contains in its combination of duble or more colors. We can choose even toned, as well as different shades. When switching radical colors is visible in hair, it is called Ombre and consistent, gentle transition from the roots of tanned hair to the light is called is Sombre. It is not difficult to get such color at home, but needs to be carefully and patiently. Everything depends on your accuracy and your color imagination in here. Ombre technology has long been by all women and girls of the world, but this technology does't stay in its place and occures new color solutions and hairstyles: new tendence is Sombre, about which we wrote and more new trend will be Balayage in 2016 trend hair color, about which we will tell you on the floor. Hair is painted very carefully in the direction perpendicular working tip of the brush. It is so difficult to get the light effect hair color at home, which requires a true Balayage technique. What choice? Ombre or Balayage. It is more correct to use Ombre type of painting for women, whose end of hair is branched and it doesn't healthy enough, because bleaching of hair is intensive made in the periphery of the hair. In addition to Ombre sometimes creates the impression as hair has not been painted for a long time and it started grow the natural hair – creating: unnatural transition from tanned shades to more light. Everything is ideal for Balayage, transition is much harmonious and the curles more volume and more underlined. Defect of Balayage is to get beautiful look and if you get ready to get this technology by hairstylist,it is right to do Balayage. Now wee weel see that how get these technologies different stars. Here you can read recommended news about brunnets and also about hair coloring technologies of blonde in this article. You should remember that for dark and natural hair colors received by majority of men, as an innocence and implicated sexuality which gives a chance brunnets to be in favorable position compered blondes. Agree with us, that absolute modesty or aggressive passionate look is tiresome and unnatural. Here we see transition dark color of hair roots to the lightest shades and the end of hair fringes is blonde shade. Of course, this type is not innovation but if you will be carefully, you will find that curles of hair are painted by the lightest color and this type of hair is included in hair color trend 2016 for brunnets. What used in here? 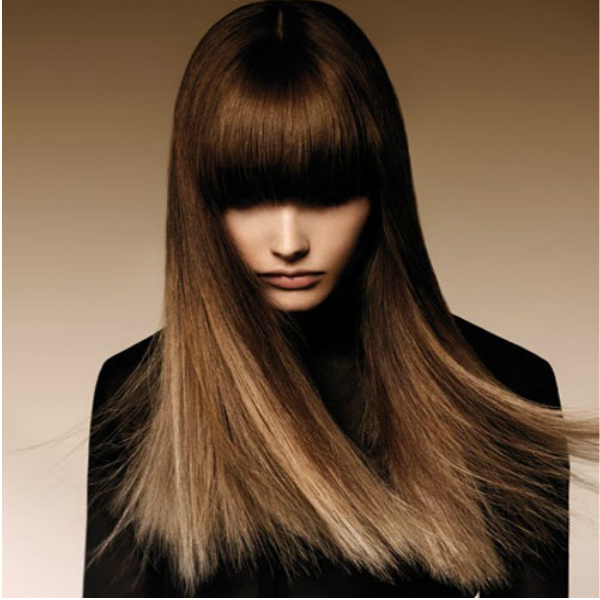 Three types of hair color were used in here- Beeline Honey, Light Blonde, Chocolate Brown. This composition gets us fresh and stylish look, there is transition from Dark Espresso to Butterscoth. You probably think that Megan Rossee and Gina Carano used two color at this photo, one of these is the shade of black color and the other is the shade of blue. This only, at first, is look, because there are three colors in here: Leather Black, Blue Onyx and glazed pecans hair colors. Elizabeth Hurley’s taste is undisputed to follow stylish 2016 hair color trend. Elizabeth Hurley is always in high position with her excellent stylish hair and mixed shades of brown in the fashion arena. Honey Blonde, Medium Brown, Dark and Golden Brown have been used in here. When you talk about Kelly Brook, the words are broom. This talented actress has original beautiful hair, which underlined by these selected colors. If you also like this style, we can only add that Iced Chocolate, Drak Blonde and lightest Beige Blonde have been used in here. Beyonce Knowles continues hit parade of new ideas 2016 for brunnets with her combination of honey and chocolate colors. If you are brunnet, you can take something from hairstyle of this beauty just for the reason that whole army of stylists work for this talented singer. We only add that Honey Blonde and Light Blonde, Chocolate Brown have been used in here too. We see Shannen Doherty with her stylished hair color in this photo. Actress belongs to the women’s which hardly introduce unreasonable innovation, but from 2016 hair color trend we can clearly note the combination of these colors. Café Noir, Madium Ash Brown and Light Golden Brown have been used in here. Kerry Washinghton have been included in the color our top ten with Light Brown, Butterschotch and Soft Black. This excellent actress is distinguished with her harmonious haircut and haircolor trend. Unicue smile, beautiful body - figure and bright eyes adding to all excellent new stylish haircuts, we will get an orginal type of actress, which is simply impossible to confuse with others. Of course, she is Halle Berry. In addition to here Medium Golden, Double Espresso and Light Blonde. We collected a hit of the best mix which are belonged to 2016 hair color trend for silver hair. Regardless of everything we think it would be good if you consult with your hairstylist and choose the best option because we don’t know about your preferences: age, eye’s color and others. We know that you are charmy. It is needed to fill the gap, in any cases, you will feel the showers of views and generous word of admiration.